At the recent National Study Group on Chronic Disorganization Conference, I learned from Dr. Wanda Bethea (www.drbethea.com) about the important of happiness. Happy people live longer, are more creative, generous, productive at work, in better health, and have higher income! Dr. Bethea shared the value of positive psychology, including the study of people living an engaged, meaningful and pleasant life. Dr Bethea’s introductions of several rating scales for happiness intrigued me in that adding a measurement tool for happiness made us even more aware of how important this emotion is to daily living. Every day we face stressors, but are we generally happy? Take the test and see. www.positivityratio.com. If you found your score deficient, here are some ideas shared by Dr. Bethea to elevate your score. Write down 3 good things each evening. Keeping a gratitude journal makes a difference. Write a letter of gratitude to share on the phone or in person with the recipient. Write about your future as if all had gone the best possible way, seeing the best possible future for yourself. Identify your character strengths and cultivate one of them in five ways during a week. Create a vision board for happiness, what makes you happy, brings a smile to you face, and bring inner joy. Find a quote you love or a silly saying to post on your mirror where you dress each morning. Do for others. Nurture optimism in those around you by celebrating a birthday, bringing a surprise, or taking a cupcake to them. Bring out the best strengths in others with affirmations. Celebrate the small quiet kindnesses in our world. So what is the happiness and organizing connection? For me it is about being and feeling your best, living a meaningful and productive life. And that is what organizing adds to in everyone’s life. Happiness is the global result of organizing. Share with me your steps to greater happiness! Take a fresh perspective to improve your and your family’s quality of life! business practices will help you reduce daily stress, create a smoothly running home, and have time for self care and recreation. The teleclass is offered by Ellen and Marla Regan. In this teleclass series, Ellen and Marla will focus on 4 departments in the Family Manager™ series. Learning how to have a Family Team creating House Rules to guide your family’s interactions and form Standard Operating Procedures for the running of your home. Organizing tips for your home. Learn how to declutter your home and use your Standard Operating Procedures to ease the stress of daily life. Techniques for time and schedule. Learn how to manage the family calendar and daily schedule. How to have “you” time. Learn to care for your body, mind and nurturing your spirit. Classes are every Wednesday in October, October 6, 13, 20 and 27. Cost for all 4 classes is $49. Call in to the bridge line (long distance charges apply) and be a part of the class. Register today as class size is limited! Paper is an overwhelming source of frustration and emotion! There are so many levels of this that I see with my clients. Being overwhelmed with the tsunami of paper. You don’t know what to keep and how long to keep it. You need a list as a resource. http://www.oprah.com/home/The-ABCs-of-Important-Papers. This online resource will get you started, but every one has a little different “tweak.” Be sure to consult your accountant for your special needs. You love articles and information. Having a paper copy reminds you to read the information. However you are getting overwhelmed with information now. Begin an awareness of how to gather information in other ways, from people, the internet searchs, blogs and other mediums. Remember that even information “gets old” in our era. Needing a system to deal with paper. You know what to keep, but you have no categories to work with paper. You need a command center system to deal with your papers, and a routine to follow up. http://www.professional-organizer.com/tips_family_communication_center.html. This online resource will help you move from overwhelmed to in control. Emotional flood when seeing papers. You experience guilt or shame when reviewing your papers. Your papers remind of you of people you did not call, tasks you did not follow through with, or general remorse about how to deal with paper. Papers are more than just paper. Working together with a professional organizer/productivity consultant and therapist can help you move forward with your paper challenges. Paper systems need to be perfect. Being a perfectionism keeps you from getting started in dealing with your paper. There must be a perfect system and you strive to create it. Working with a professional organizer/productivity consultant can help you create your personal system and routines. It can be more than just bits and scraps to you. Identifying where youare paralyzed can be powerful. Partnering with a professional organizer/productivity consultant will get you unstuck. What awareness comes to mind for you with paper? Read along with Peter Walsh’s book Its All Too Much and discuss organizing challenges you face. Fee based membership of $120 for all sessions. Pre-registration required. 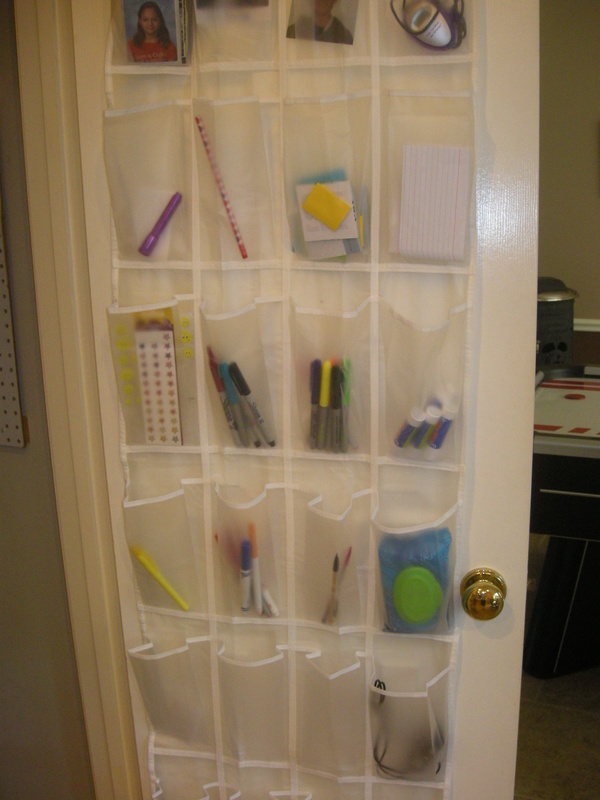 Shoe Organizer: More than just organizing shoes! Be sure it fits safely over the door and the door can close. The clear shoe holders are great to see what is in the pocket. Some are longer, some shorter. If you want your kids to access the items, be sure to use the longer one. This item is available at Target, WalMart, Bed Bath and Beyond and more at a very reasonable cost. The list is endless! How are you using the shoe organizer? https://professional-organizer.com/WordPress/wp-content/uploads/2016/07/logo.png 0 0 Ellen https://professional-organizer.com/WordPress/wp-content/uploads/2016/07/logo.png Ellen2010-09-18 09:47:052010-10-09 19:12:11Shoe Organizer: More than just organizing shoes! Hoarders have become a national fascination! Not only we do all know families struggling with this challenge, we know how tragic these situations are with respect to finances, emotions, safety and sometimes legal aspects. 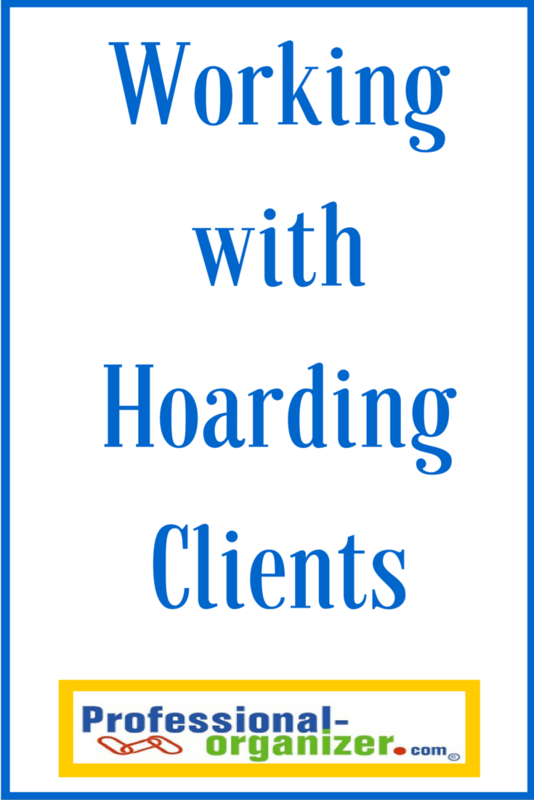 Work with a hoarding situation begins with the client. Who is the client? It is the hoarder, even though the family, friends or other community members want the home decluttered. An assessment of client readiness for change makes the difference. Is the client ready to begin the process of letting go, creating a new way of life, and working toward maintenance and balance of acquisition ? As a professional organizer, the first phone conversation with the hoarder tells me so much about our work together. A successful approach for hoarding includes a team. The team members are the client, the therapist and related professionals, the professional organizer, assistants to the organizer, skilled labor or other trade professionals as needed, and possibly haulers. Collaborative therapy, where the client works with both a therapist for inner change and a professional organizer for outer change, makes for the best possible work arrangement. As a professional organizer, I also find my hoarding clients work best with additional team members. The energy that more people bring, the additional hauling off capability, and the resources that all the other team members bring to the project, neutralizes the shame and perfectionism the client is feeling. In our work we usually find several home repair projects as we progress. The project moves forward more quickly by having a handy man, electrician, and other trade people to call in as needed. Work with hoarders proceeds at their pace. With my own clients and their cases, we work on a regular basis, working in most difficult areas together. Together we establish guidelines for donating through coaching. Clients are encouraged and affirmed in good decision making. Trust is the most important aspect of our relationship. Clients see me as a motivator to change. Every situation with hoarders is different in terms of how quickly progress occurs. Fall means back to school! The sunny days of summer are over and fall is a great time to tackle those home projects. Join me in learning more about organizing strategies at these upcoming events! Fall Refresh is an engaging afternoon program about organizing and interior design. Certified Professional Organizer Ellen Delap will present Out with the Old . Interior Decorator Leslie Sarmiento will present Company’s coming! Refresh your home by decluttering and adding the latest in decorating trends. Bring at friend and join us at this free presentation at Kingwood Public Library at 1 pm. Join me for strategies to help your student with AD/HD achieve the success she/he deserves. Class is free at Kingwood Public Library at 1 pm. Have you had a life long struggle with being organized? Need support from a community of people who are equally overwhelmed? Join me in learning from others in the Clutter Support Group. This membership based group is the starting point for your journey in transforming your life, helping you define, establish and maintain an uncluttered lifestyle. Group meets for 6 weeks, starting September 21. Fee of $120. Contact Ellen for details. Take a fresh perspective to improve your and your family’s quality of life! The Family Manager™system transfers management skills and strategies from the business arena to running your home and personal life. Family Manager skills help you reduce daily stress, create a smoothly running home, and have time for self care and recreation. Four weekly one hour teleclasses on October 5, 12, 19, and 26. Fee of $49. Contact Ellen for details. Technology and You! Calendars, Addresses and More! It used to be we relied on paper and pencil. Now there are many outstanding ways to stay on top of dates and details. The best tool for this? Here are some options! Never forget a date again with google and the google calendar. Input your info from your phone or from your computer. Its with you all the time so you can consult your calendar and then make a plan. Add dates right away while at the doctor or at school. And you can keep track of all your family on this calendar. Share your schedule with Dad, mom and kids. Everyone can enter information so right away you know when your kids’ soccer games are, their test dates and more. Enter birthdays, anniversaries and other special events and mark them as recurring events. You will be alerted for these. And this is all free! Never lose track of someone’s address or phone number again. Using Outlook makes keeping it all together so easy. Upload information right away from email and add phone and address too! I also suggest adding your own signature line to your email. This is a way to share your contact information right away. (Here are some instructions for adding this. http://email.about.com/od/outlooktips/qt/Create_Email_Signature_Outlook.htm) If your phone synchronizes with Outlook you are totally set! I love having lists ready to go! So why reinvent them? A great service ListPlanIt.com has lists for every possible need. With over 500 lists to choose from, you will have them at your fingertips. Check it out and see what you think at www.listplanit.com . Have technology that works for you? Share that tool here! https://professional-organizer.com/WordPress/wp-content/uploads/2016/07/logo.png 0 0 Ellen https://professional-organizer.com/WordPress/wp-content/uploads/2016/07/logo.png Ellen2010-09-03 08:32:482010-10-09 19:12:38Technology and You! Calendars, Addresses and More!